Basically the Fan Dance has been used since WW2 as the physical and mental determinant of whether special forces troops (SAS and the like) and parachute regiment troops are up to task. Fail this and you’re out, in short. 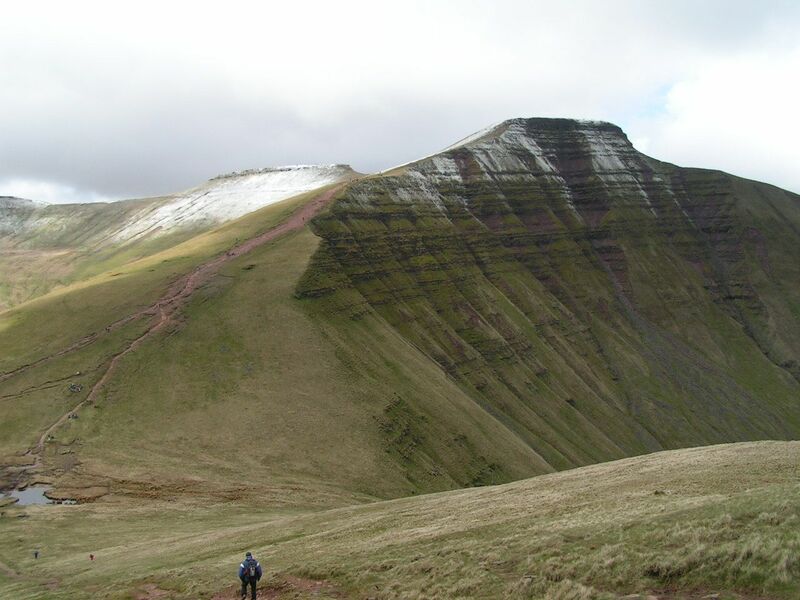 It is about 24km in length, has about 5 or 6 thousand feet of ascent, and covers the highest mountain in south Wales, Pen Y Fan, twice. The Fan Dance has received notoriety in recent years as a few members of the armed forces died on this particular course for being ‘yomped’ a bit too hard. It has now been opened up to the public as an event for people who think that Tough Mudder is a bit easy. I’m not one of those, I have to say, and having done Tough Mudder last weekend, I presently think I am a bit mad, but hey ho, as they say! The challenge is further ‘complicated’ by the fact that you need to carry between 35lbs and 45lbs of weight on your back, PLUS your food and water. There is also a cut off time of four hours. I have calculated that the two and a half litres of water than I plan to carry (two litres is mandatory, and they weigh everything before you start), plus food, will weigh about another 7 pounds, so I am looking at potentially 50 lbs on my back. I’ll update this on Sunday all being well, and let you know how I get on. I’m not aiming for the cutoff time, just to get through it. I’m thinking 7 hours will be good, but maybe that is ambitious too, especially as the weather is supposed to be hot, at 20 degrees much too hot for this sort of thing for me. 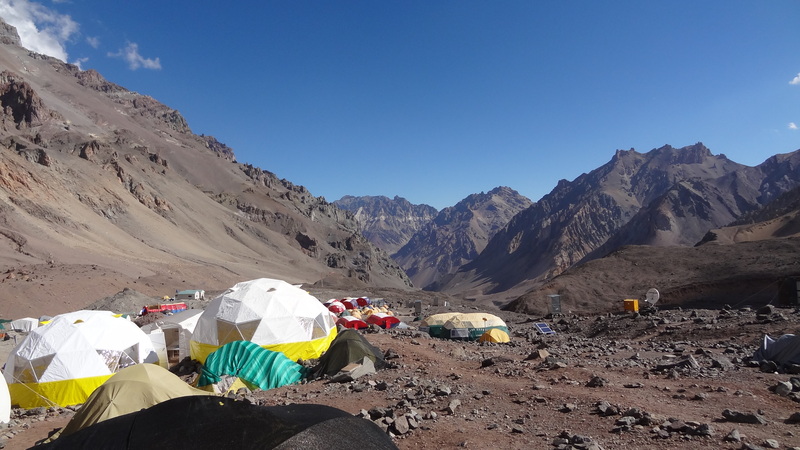 So the (very) last day on Aconcagua began with an earlier wake up call than anticipated. The tent (complete with bunk beds, no less!) that Mohammed and I were now sharing with four other US climbers, who were just commencing their climb up the mountain, saw them rise at about 6.30 to get ready. As we didn’t really have to be anywhere before 9am, then this was a bit of a waste of badly needed sleep. 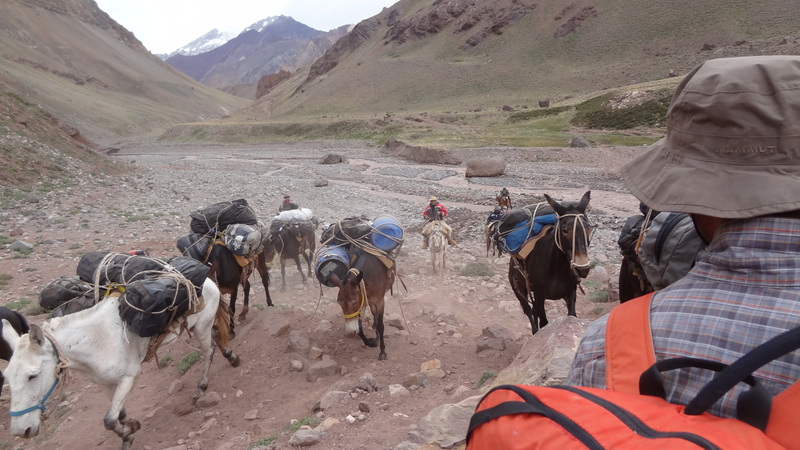 But no matter, we had packing to finish anyway and get our duffles ready for the mules who would take them down the remainder of the mountain for us. Our carrying days were done, it was just half a rucksack from here. After a final breakfast at Base Camp we set off from our base at 14,200 feet to take us down to the trailhead via the ‘Normal Route’. 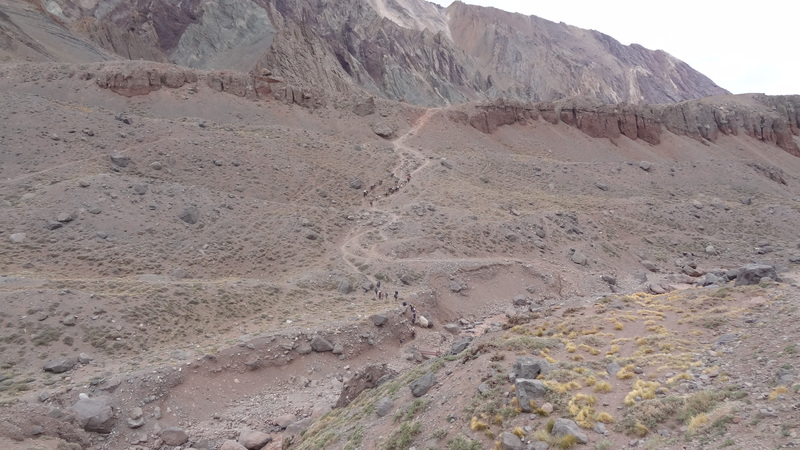 Our journey had effectively taken us on a 360 degree tour of Aconcagua, starting from the south east going north, and now heading due south from the North Western corner. To get to the trailhead was a fairly simple trek out of just over 20 miles. Leaving Base Camp was a bit of a nostalgic affair for me. Having tried not to make any snap decisions about the future, I didn’t know if I’d ever be back for another go. It’s a massive commitment in time and money to get this far and not summit, and so I had a lot of evaluating to do when I returned home. Did I belong at 7,000m? Questionably nobody does, but some people make it and some don’t, and I hadn’t, simple as that. We didn’t expect to be in down jackets for the trek out, but it made it easier really overall, as it was cool and windy, if a bit dusty. The trek out was cool and windy, a sharp contrast to the two warm days before. We passed most of the time by playing word games, like where you name countries or cities and have to start with the last letter of the word used by the person in front of you. I think we ended up with Eduardo winning one and me one, by which time we had had enough. We had a brief break at Camp Confluenzia on the way down at about 12 miles, an overnight stop for those coming up the mountain by the Normal route. Approaching the river close to Camp Confluencia. A river crossing towards the bottom of the trail. And that’s it – we are done! We got to the trailhead at about 3.30pm, a six and a half hour trek, at a fair pace most of the way. From there we were met by a Grajales van who picked up us and our duffles from the mules. We were initially taken back to the Los Penitentes Hotel to collect the things that we had left there pre-Christmas, and from there it was a two hour drive back to Mendoza, where we arrived at about 8pm. So that was that. It was over, after two and a half weeks, 14 of them on the mountain itself. Both Gary and Mohammed got early flights out of Mendoza to get them home ahead of time. Because we had summited on the first available day of the schedule, we were effectively down three days early. I tried to get an early flight too, but the cost was prohibitive, around $1,000. I thus decided to hang around in Mendoza’s sunshine and take in the sights. Each of Pete, Fred and Eduardo did too, and we went on a couple of winery tours, ate steak until we couldn’t eat steak any more, and drank our share of what Mendoza is famous for – Malbec. They were a wonderful few days. Our final evening when we were all together was on the Wednesday night. 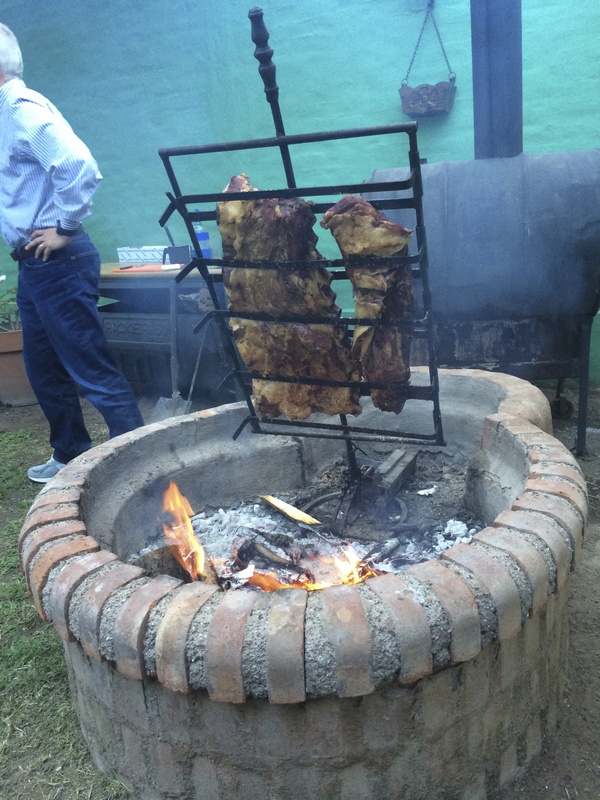 We were taken to a house (a friend of Tincho’s) on the edge of town, where we treated to an ‘Asado’, the Argentinian word for a long barbecue with friends. The food, of beef ribs, empanadas, cheese, vegetables and all manner of other dishes, was simply the best tasting food I have ever eaten. It was a wonderful and fitting trubute to the end of an epic and amazing adventure. 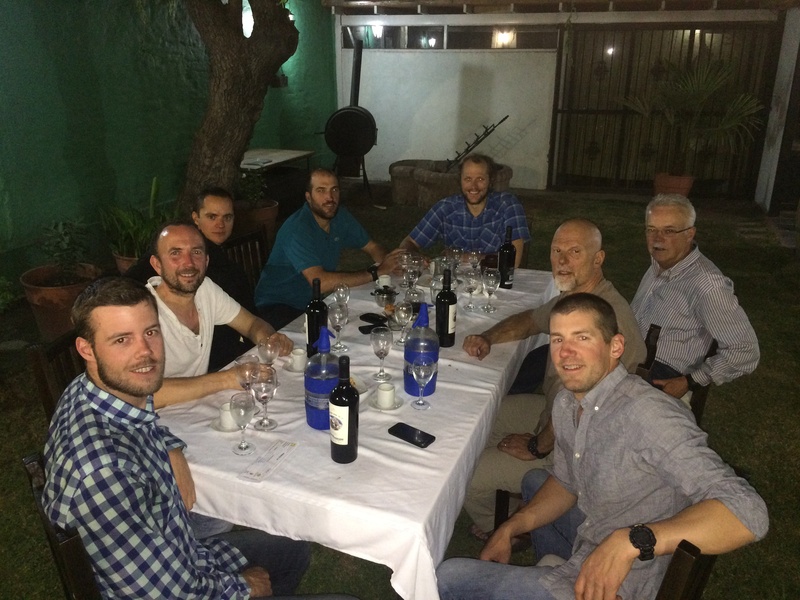 The ‘last supper’, our celebration in Mendoza – probably the best meal I have ever eaten. No, definitely the best! It would be very remiss of me not to pay tribute here to our guides Peter, Johnny and Tincho, the former two from IMG and the latter from Grajales. 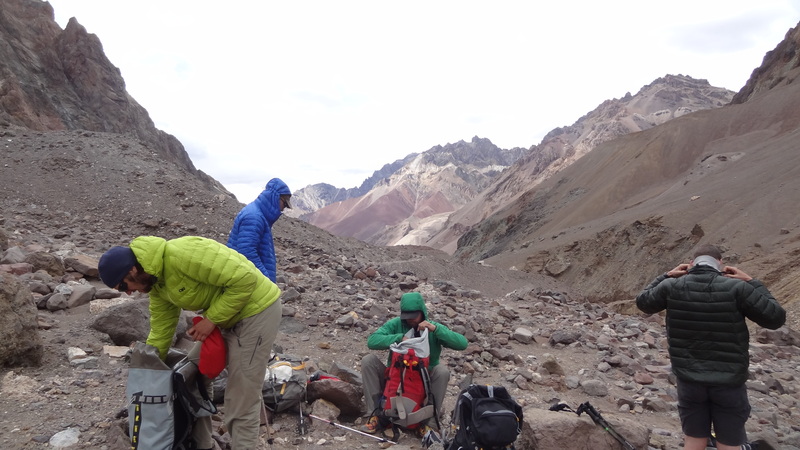 Although this trip had been ‘expedition style’, whereby we’d carried our own loads and the group gear, pitched tents ourselves etc., that doesn’t take away at all from how much the guides do. They fed us every day, they collected and treated water, they tended to our needs and also gripes and groans (of which I have to say they were very few indeed). They crucially got us up the mountain and into a position to make an attempt on the summit. Without Johnny and Tincho carrying a staggering 75kg between them the night before summit day, I believe that no-one from the group would have summitted at all. The high winds which came in the following two days would have put paid to probably even an attempt. But even more importantly than that they kept us safe. 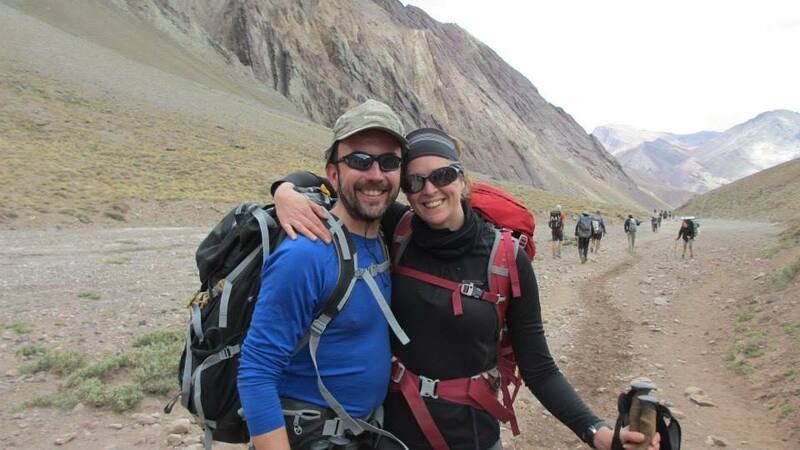 Mountaineering is a dangerous game, and Aconcagua is a dangerous mountain. People die up there and get badly sick on a regular basis. Their calm, controlled and strong leadership meant that we just had to concentrate on looking after ourselves, and keep on putting one foot in front of the other when told to. Oh if only it were so easy! 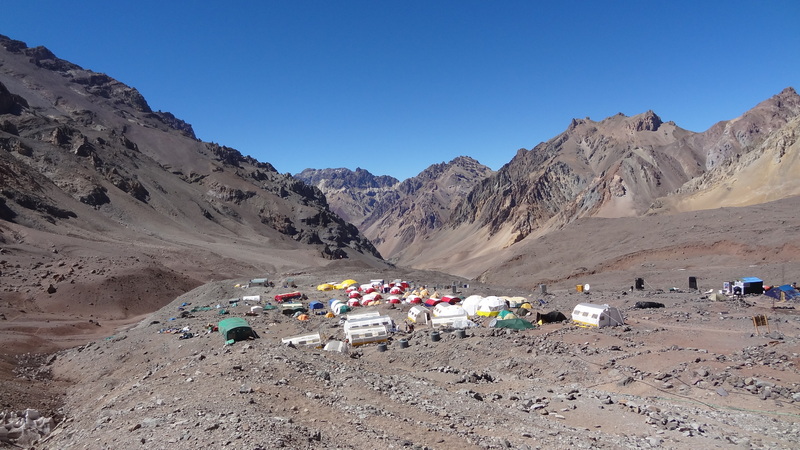 Goodbye Aconcagua, or maybe it is just ‘au-revoir’. You are my nemesis for now, and perhaps for always, but you have given me the biggest, longest and hardest adventure of my life. A journey of learning, of amazing experiences, of new friendships, of new sights and sounds. Something to be more than remembered for all time. Something that few people on the planet will ever experience. I am indeed a lucky man. 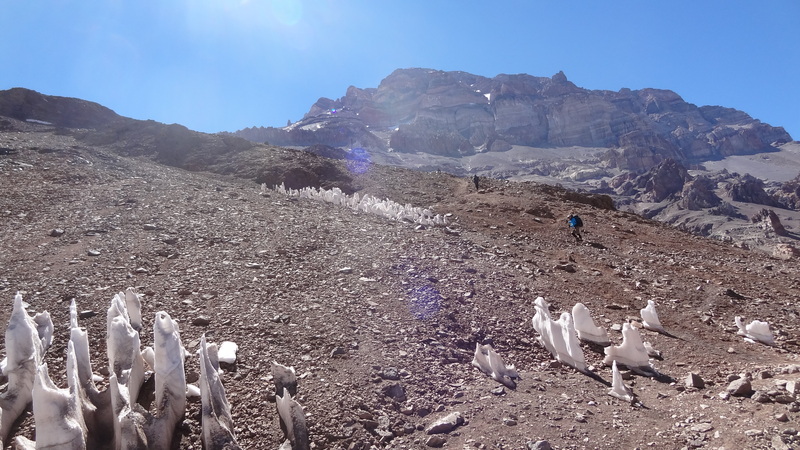 Aconcagua Day 17 – January 5th 2015. Waking up for the first time at Base Camp on the ‘Normal Route’ side of the mountain was an eye opener. It was easy to forget that we were still at 14,500 feet. The air felt relatively fresh, and warm (even if it was actually only 1C or 33F), and it was breathable. If you walked uphill though, even back to your tent from the toilet, you still get out of breath reasonably quickly if you don’t take your time. 14,500 feet is still high altitude, and you have to still also drink more water than you normally would and look after yourself. I was glad to be there. I had dwelt overnight as to the merits of my decision the day before to descend the mountain with my AMS. Could I/should I have persevered? The more I thought about it the answer was no, but you are always left with that nagging doubt. I had after all made an entirely voluntary decision to come down – no-one asked me to. But without being overly dramatic, people die up on top of high mountains like that. The refuge at Camp Cholera (Elena, after the climber of the same name who died there) bears testament to that. Also Tincho had told us of a client of his who had (recently) successfully summitted, than sat down at the very summit and died on the spot of heart failure. Nothing, to state the obvious, is worth that. This one has quite different views to the Guanacos Valley side – this view towards the west side of the mountain. 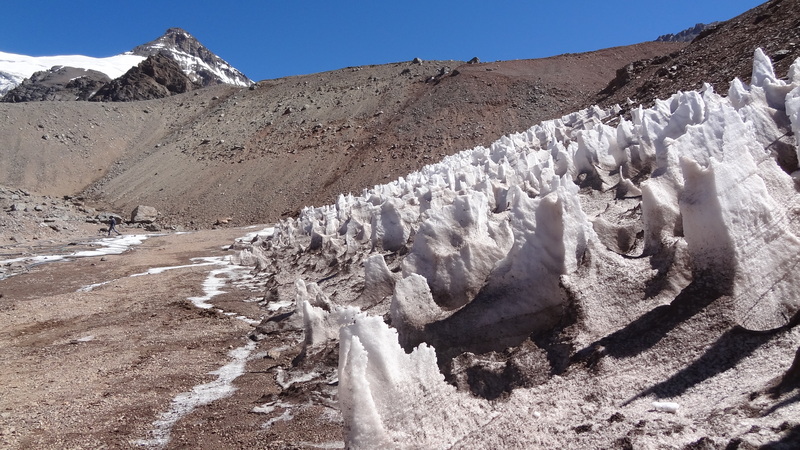 Plenty of ‘penitentes’ ice around too, reminding us that despite the sunshine, it is still a cold and inhospitable place overall. I spent the day sorting out kit and waiting for the rest of the group to descend. Mo and I also had a walk around the Camp, took some pictures, and visited the ‘highest Art Gallery in the world’, which is basically a tent where a hippy guy lives and sells some freakishly expensive (and a little too way out for my tastes) paintings. 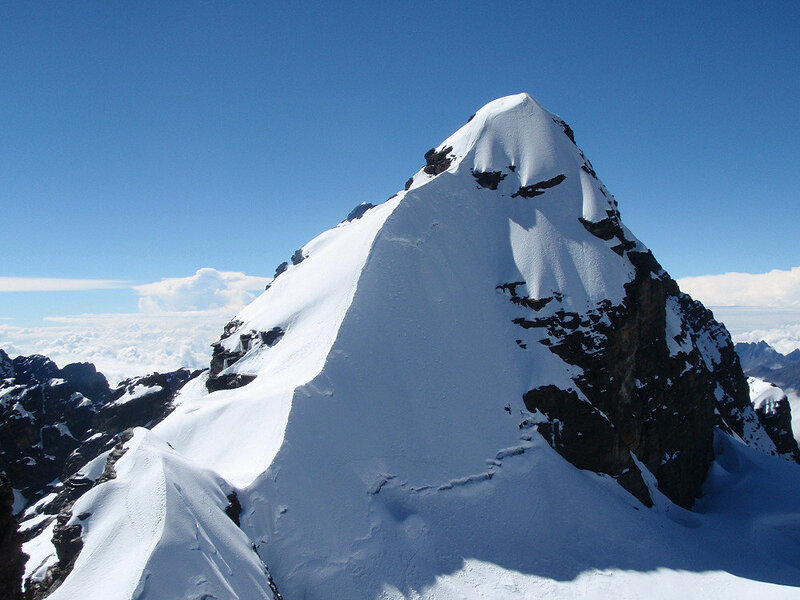 We also had had the news overnight that each of Pete, Fred, Eduardo and Gary had all made the summit. I was delighted for them – they deserved it, and I knew (or thought) they’d make it too. They arrived back down at about 2.30pm to much high fiving. 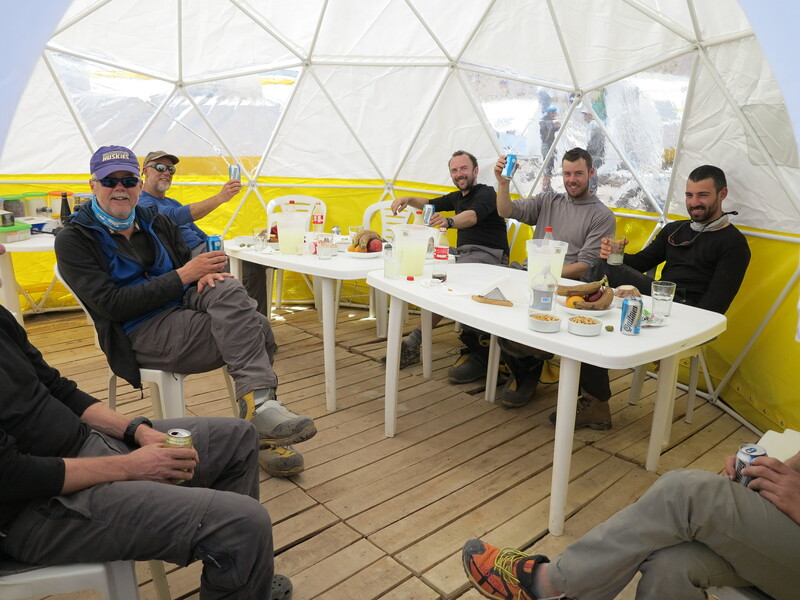 They were all pretty exhausted, partly due to the fact that this morning up at HIgh Camp the winds had been pretty ferocious and threatened to rip tents apart. 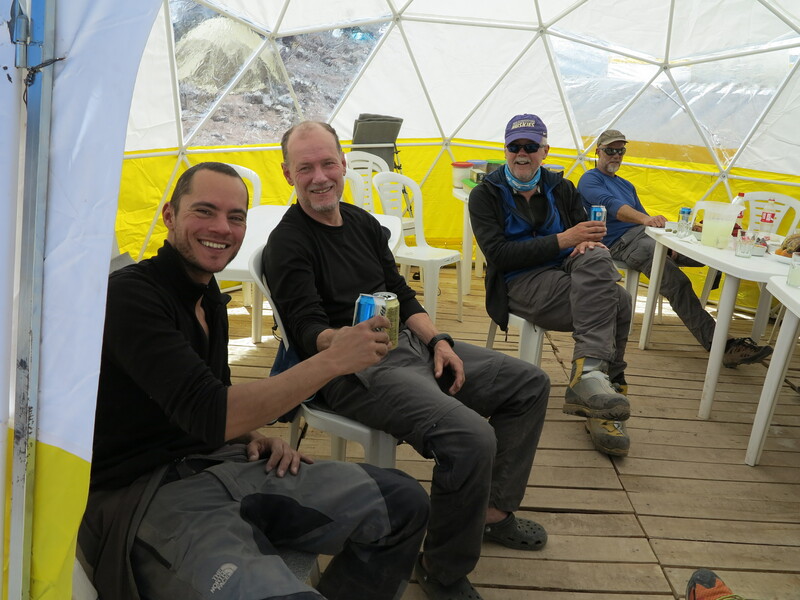 A celebratory beer at Base Camp! Fred, Gary, yours truly, Pete and Mo. Eduardo, Martin the German doctor, Fred and Gary. 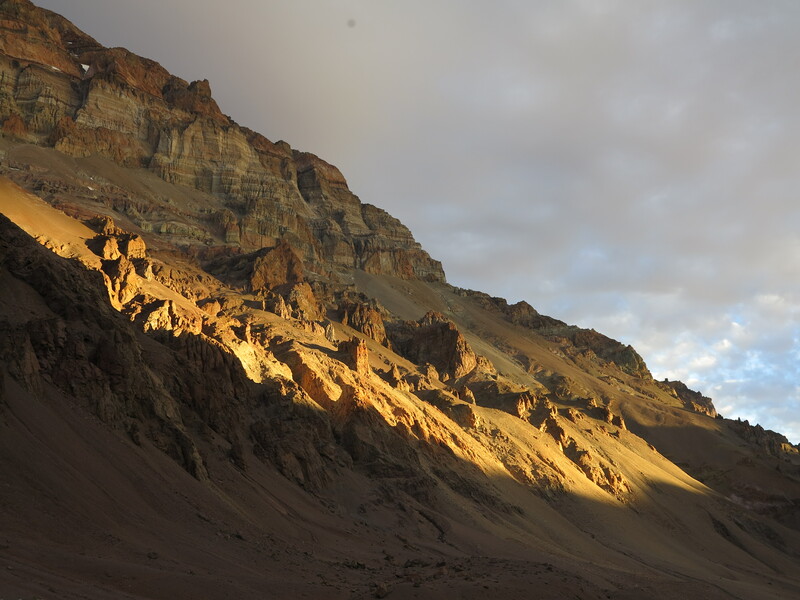 The sun begins to set on the western flank of Aconcagua – maybe the last time I’d see the sun set here, who knows. 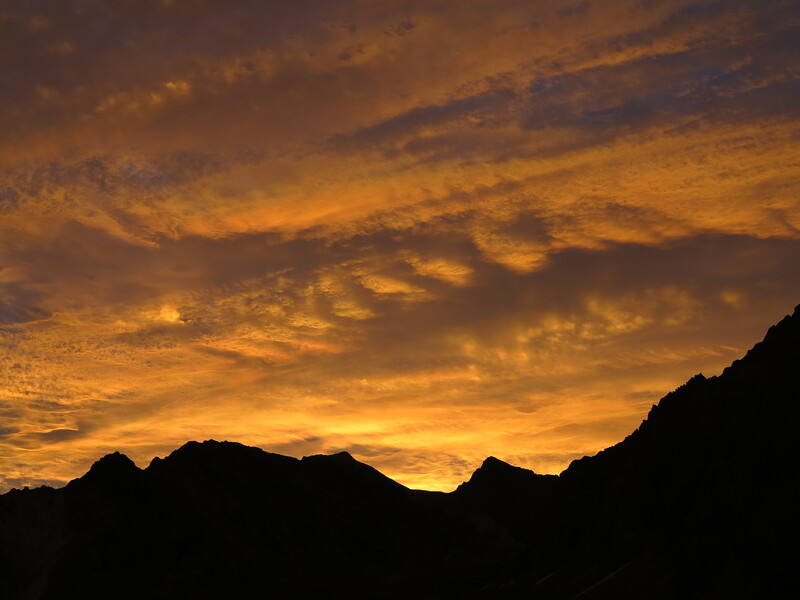 And the final sunset over the mountains as we hit our tents. Stunning. Eventually once everyone had exchanged stories we all had a steak dinner in the tent courtesy of Grajales, and everyone retired to a well earned sleep fairly early. Tomorrow we’d need to trek out of camp, and it was upwards of 20 miles, which would tax everyone again, if not exactly technically. 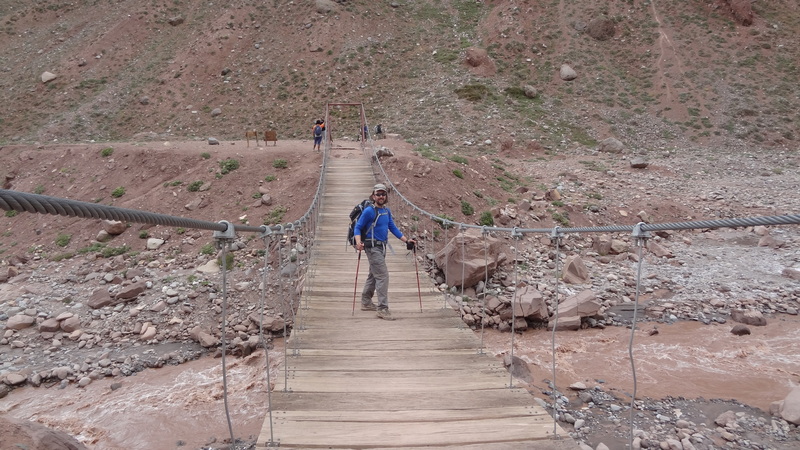 So this was my last night on Aconcagua, and tomorrow late on we would be back in Mendoza. So much to reflect on, and so much to look forward to as well. That’s the thrill, uniqueness, and challenge of the mountains. 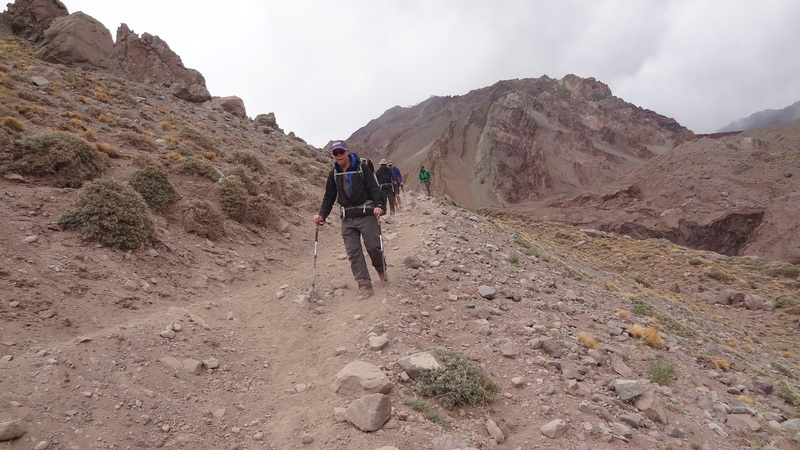 Aconcagua Day 16 – January 4th 2015 – to the summit or not??? 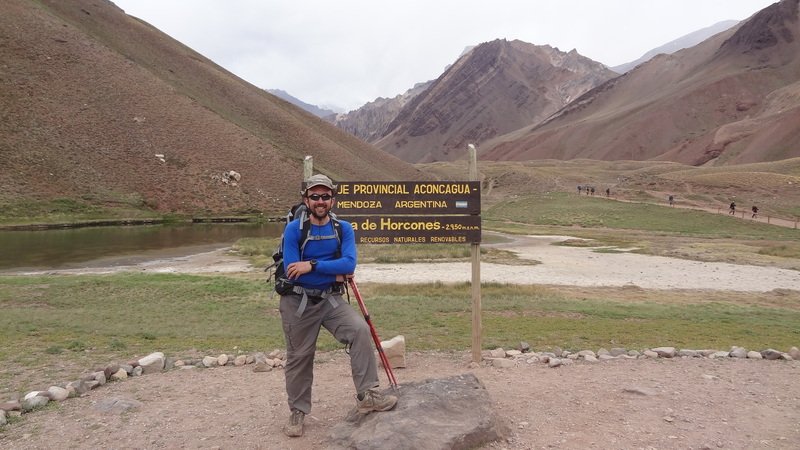 If you’ve followed this post from the previous one, you’ll know that here I am at 6,000m, or 19,800ft, and am hopefully waking up for a 5am departure to the summit of Aconcagua. All I’ll tell you is that that it was by far the longest night of my life. From settling down in my sleeping bag at 7pm the previous evening until the point in time that head guide Peter knocked at the tent to rouse us, I didn’t sleep one wink. I couldn’t. My headache was pretty bad. My breathing, which I thought I would struggle with, was absolutely fine, but my head felt like it was in a vice. I had AMS, and I knew it. I told Peter as soon as he came to the tent at 4.30am, and after some discussion he suggested I take 250mg of Diamox, and try to get some rest. My attempt, and any thoughts even, of the summit, were over immediately. It was now about being safe and well from now on, and hope that AMS remained at just AMS. The troop departed at about 6am, and I wished Gary my tentmate the best of luck. He’s as strong as they come, and I knew that if anyone would make it, he would. I hoped they all would of course too. I wasn’t alone in not ascending that morning. Mo had woken up in the middle of the night with a hugely swollen eye. Peter had attended to him and said that he had a facial edema, so his ascent was over at that point too. Tincho, the local guide, stayed behind to attend to us, and he came into my tent at about 8.30am. My headache wasn’t improving much at all. I knew I needed to ascend, and asked Tincho what the plan was. He said we should wait two hours and he would make a recommendation at that point, which wasn’t really the news I wanted, but had to accept. He then returned about 5 minutes later however, and said we’d go at 10am. The reason was that another climber with Grajales (the local guides that Tincho belonged to) had taken ill in the night too with AMS. He needed to go down too and would join us. We’d all go straight to a Doctor at the bottom. Tincho asked if I could carry my gear, or otherwise we could book a porter to come up to help. The thoughts of putting 20kg+ on my back in the condition I was in was fairly horrible. I knew however that if I didn’t it would delay the 10am departure, so I said yes, and began the difficult job of packing when you can’t function properly and feel like complete crap. We duly began our descent, the four of us, in freezing conditions, towards Plaza de Mulas, Base Camp on the ‘Normal Route’ of the mountain. I couldn’t feel my hands, despite two pairs of gloves, a merino wool pair covered by my warmest Goretex skiing gloves. The next two and half hours is a bit of a blur really, but helped by an incredible desire to ascend, the fact that the air was palpably getting thicker by the minute, and the knowledge that if I stayed up high any longer I was putting myself in harms way, I put all my concentration and strength that I had into it. I was weak, very weak, partly due to the fact that I hadn’t slept for 36 hours. We got down by the ‘Porters Route’ mainly scree, in about 2 and a quarter hours. It was exhausting, but rolling into Plaza de Mulas shortly after midday was a great feeling. I knew that even though I was still at 4,400m (14,900ft) I was in air that I could breathe and that I’d be ok. My headache was still there, but better, much better. We were greeted by Grajales staff, and given juice, pizza and cake. It was wonderful. It was even warm – people were in T shirts, and what a contrast to the numbing cold that we had left behind. 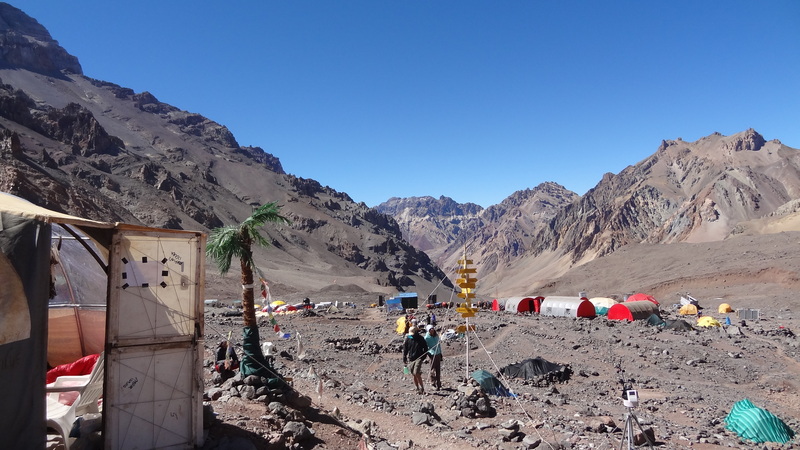 Base Camp (Plaza de Mulas) comes finally into view. We we assigned bunk beds in a tent alongside an elderly Canadian Team who had just arrived too heading in the opposite direction. I lay on my bed and slept like a baby for about three hours. It was bliss. 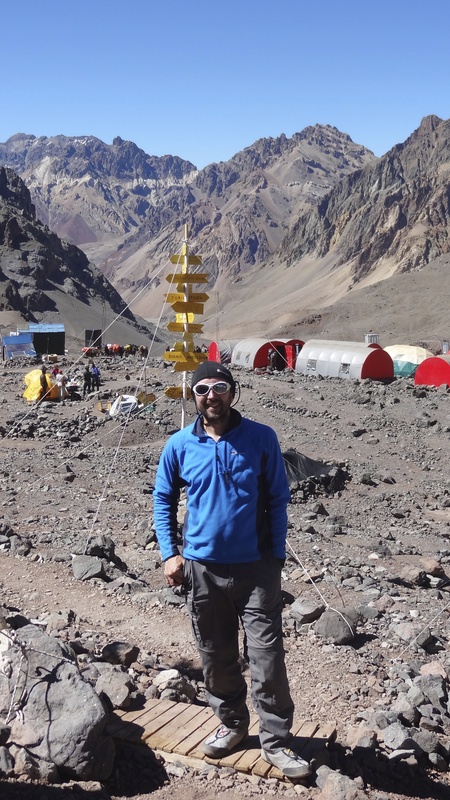 My summit, Aconcagua, was over, but I didn’t care. I was safe, it was good, I would take stock when I got back, now just wasn’t the time. Base Camp is a relief, even if I would rather be on the summit. The view the other side of Plaza de Mulas, looking up to where we had just come down from. The summit is well off to the right of shot out of sight. There’s even a plastic palm tree at Plaza de Mulas! At the end of the afternoon our Doctors appointments duly came. I was passed as fine, other than my AMS, and told to keep on taking Diamox until I reached Mendoza, which I duly did. Mo was fine too – his eye swelling had dramatically improved on the way down, and so the decent obviously made a huge difference to him. The pictures I saw subsequently of his swollen eye at Camp Cholera were horrendous – he looked like a bug-eyed chameleon who had then gone ten rounds with Mike Tyson – not a pretty sight at all. He said afterwards that he felt that his heart was actually beating in his eye, it must have been a scary experience. The interesting thing about this day for me was the fact that the German climber (the doctor) had also got AMS. 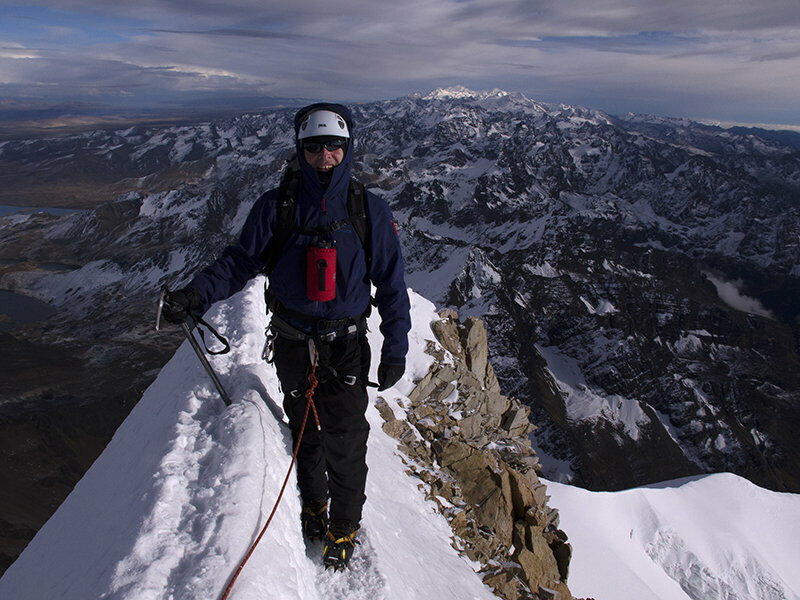 Here was a very experienced climber who had done Aconcagua before, Denali, Kartstenz Pyramid and all manner of other high and scary mountains, and he was prone with AMS also. He’d also looked as fit as a fiddle all of the way up the mountain. As he said at the time though, “I’m a human being just like you, it can happen to anyone”. I have to thank Tincho most of all for this day. He was brilliant. He hadn’t ascended the mountain himself as he was also sick. He had a terrible sore throat and had been very much under the weather for days. Despite that he’d carried 38kg on his back the day before to give us the summit shot, and here he was tending to the sick and needy and haring down a mountain to get them all to safety. ‘Chapeau’ as they say in cycling. So my day was over, and my thoughts and hopes of summiting Aconcagua too. There was no going back up. It would either be never, or a long wait for another day. Now wasn’t the time to dwell on that. News came later of successful summits for each of Gary, Pete, Fred and Eduardo – ‘chapeau’ to them too. If any of them are reading this and would like to write up a piece for me to insert of your summit day and experience then please let me know, and I’ll put it up here too. I know from your stories afterwards of how much mental and physical energy it took, and my hearty congratulations again to you all. Today we woke up at about 6.30 to a snowy and cold world at Camp 1, our third or fourth morning here, I can no longer remember. Looking out of the tent however gave no suggestion that we were going anywhere soon. The wind was still howling down the valley, and there was at least two inches of snow and ice outside. On the upside, the sky was blue – bluer than we’d seen it so far in fact. That also made it colder though – the temperature outside was about -10C. We were visited by Peter at about 8am, to say that the move was on. We didn’t need to be told twice and began packing immediately. By around 10am everyone was fully laden with group gear, food, tents and our own kit, and we were moving slowly up the mountain. This was the same section where I’d had my ‘turn’ two days before, so I was not a little apprehensive. But I had to put those thoughts behind me – I’d been passed fit, and I was here to give this pig of a mountain my best shot. We moved at a pretty slow pace, which suited me just fine. The strategy was three breaks for water, but no other stops at all. The sun continued to shine, and sadly I have no photographs to show for it. My camera battery died in the cold this morning, my iPhone is dead and has been for days, and I have no spare camera batteries with me. Lessons learned and all that. The whole group stayed together and worked well. There were also at least two other groups headed up alongside us, one from RMI and the other I believe from Alpine Ascents. Everyone had been stuck at Camp 1 for at least four days, so this was moving day for everyone (due to the forecast), cold or no cold. 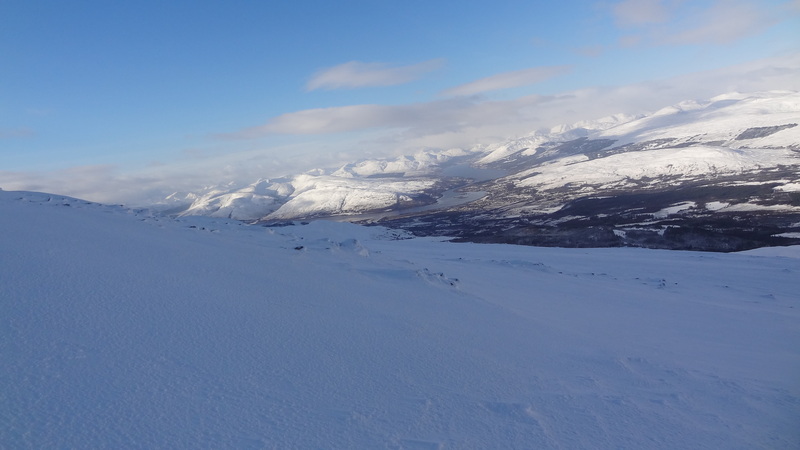 At times the wind gusted brutally, and we had Goretex layers on top of down, plus long johns etc. I wondered just how colder this mountain could get. 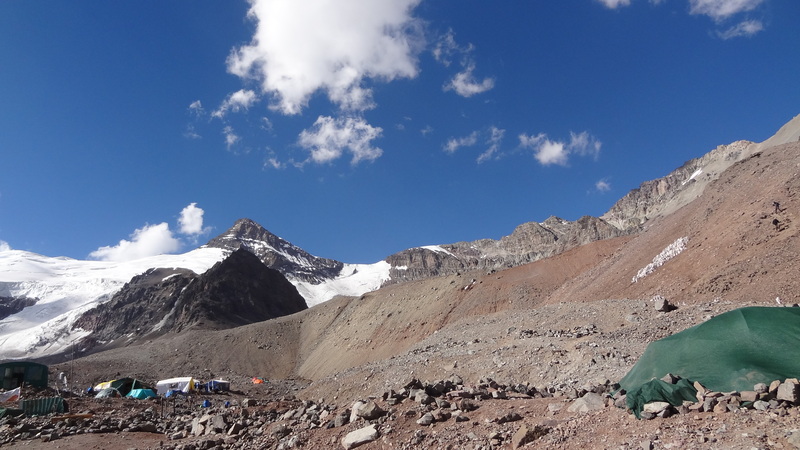 I passed the point where I had previously ‘wobbled’ without incident, and we all got into Camp 2 (5,550m, or 17,900 ft) at about 2.30pm. By the time we had erected tents, using boulders this time instead of rocks, it was about 3.45pm. 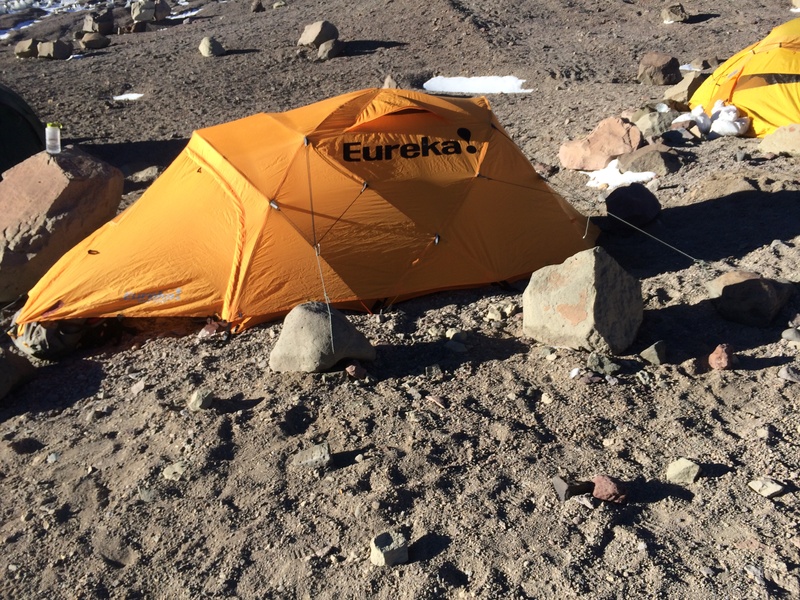 Camp 2 is wonderfully perched with spectacular views over the Andes, and I just wish I could take a picture. It was also due to be an altitude record for me in terms of sleeping, the previous highest being Gorak Shep in the Himalayas, so I just hoped I could sleep at all. Just being still in my sleeping bag, my resting heartbeat was over 100, and if you moved or sat up too quickly you were out of breath very quickly. 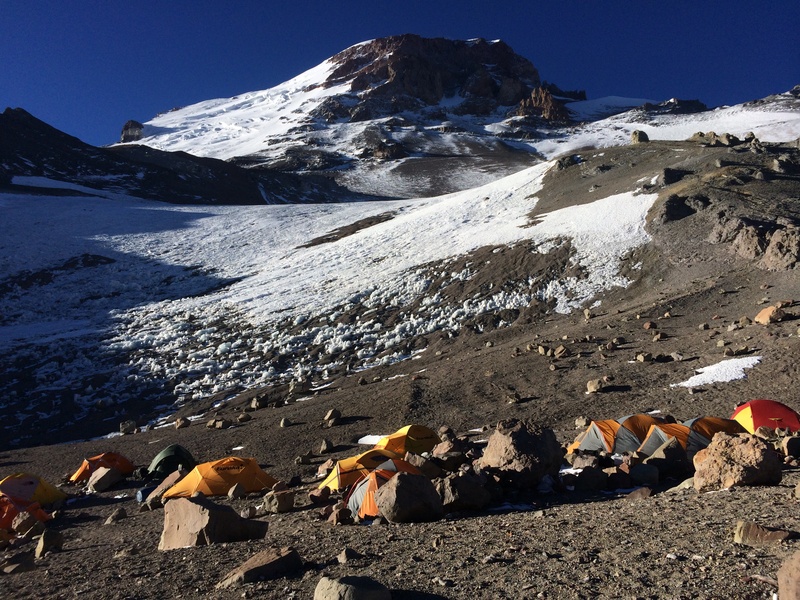 The tents pitched at Camp 2 – there are prettier places to camp……. 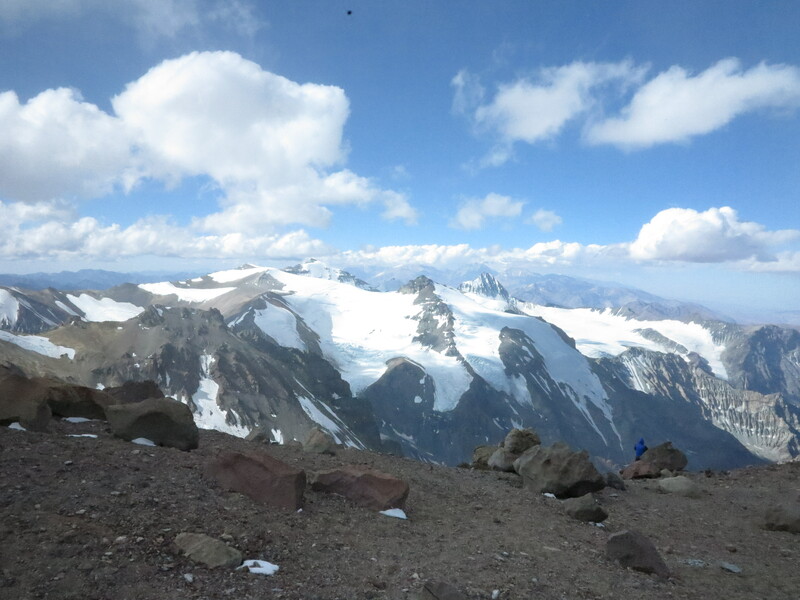 ….but the views over the Andes are utterly spectacular. 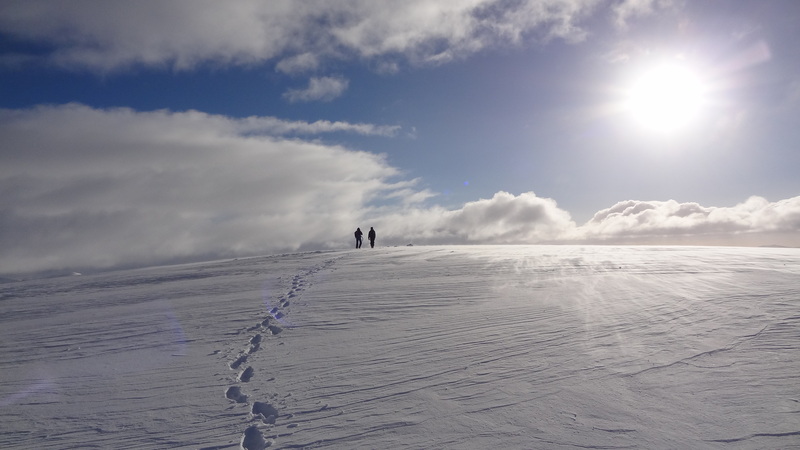 Having settled in, we figured that the plan from here should get us to a summit attempt around the 6th January (this is the 2nd as I write this). We’d move some stuff tomorrow, then come back here tomorrow night. 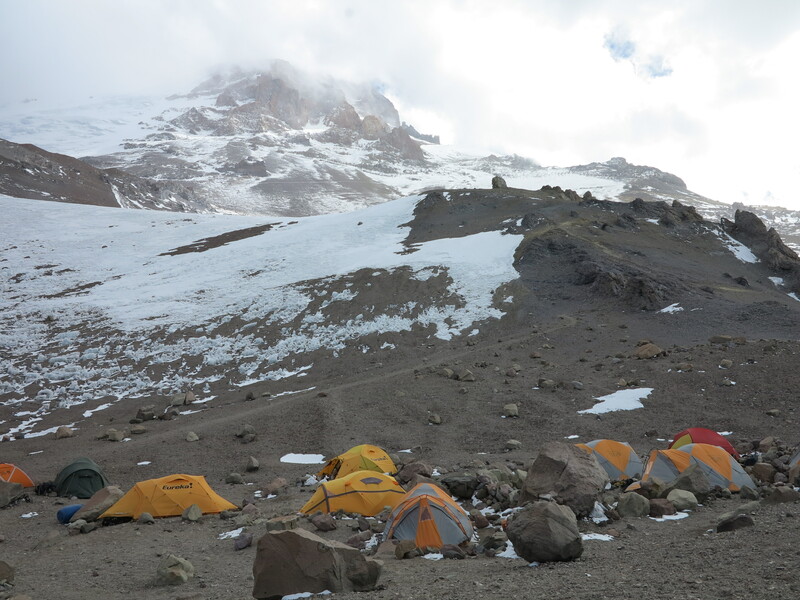 Then weather permitting we’d move tents and Camp to High Camp at 19,800 feet or so on the 4th. 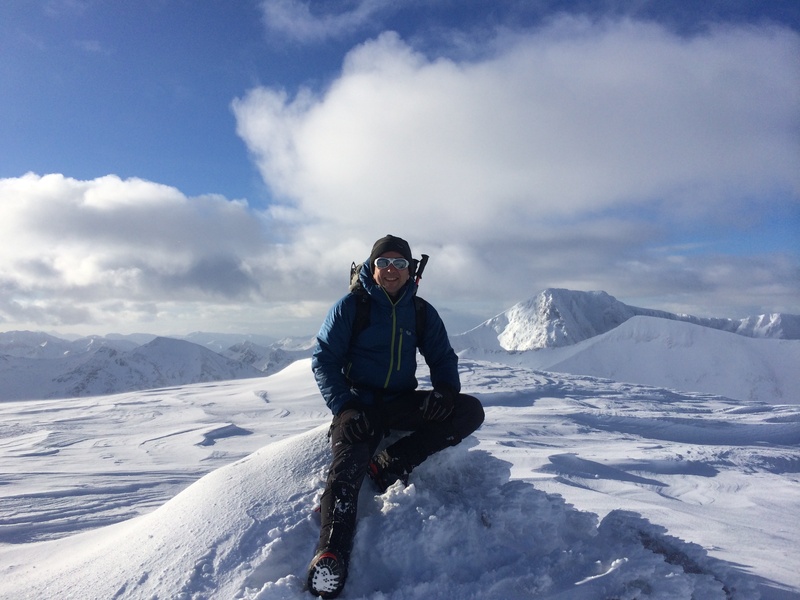 A rest day on the 5th should give us a summit attempt early on the 6th January all being well. But just after a dinner of pasta, pesto and sun dried tomatoes, Peter came to our tent to give us an update on the weather forecast. It seemed that bad weather (high winds of 50mph plus) was coming in on the 6th, and the 5th didn’t look much better either. There was however a full moon on the 4th, with potential winds of just 25kph, almost unheard of on this mountain. There was therefore a change of plan……. 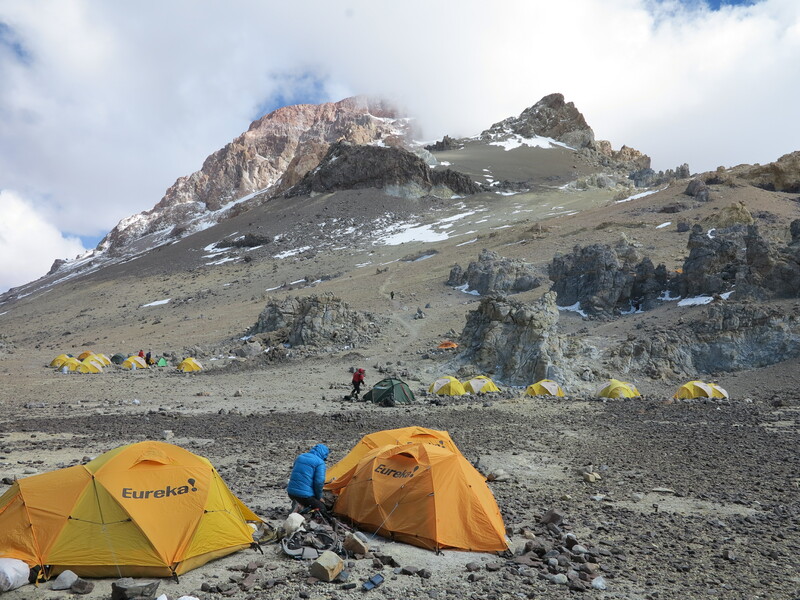 We’d now move camp again tomorrow morning to High Camp as long as everyone felt up for it after our night here, and then after a brief sleep we’d go straight for the summit on the morning of the 4th. That’s about 36 hours from now! As explained to us, it was basically a one shot attempt, as if we didn’t make the weather window, we were going down. I think we all knew at this point in time (or maybe it was just me, who knows) that to get 5,000 feet higher than we were now inside less than two days, having just come up 1,800 feet today, on the World’s tallest mountain outside of the Himalayas, that not all of us would make it. But it was on, and we’d get a shot, hopefully, and that was what we were all here for. It doesn’t, and couldn’t, get any more exciting than that.